Design is not really a science per se, but there are some basic ‘rules’ that one can follow to achieve that appealing designer look. – For a cohesive theme choose one color 60 percent of the room, use two accent hues (15 percent each) and spice things up with a pop of color that’s brighter than all the others (10 percent). – Curtains should at least skim the floor or have at least a half inch break. For a fuller look you can add two or three inches and puddle them. – Table lamps near sofas/chairs should have the bottom of the shade at eye level. Having the middle of the shade between 36 to 42 inches from the ground is optimal . Sixty- eight inches is the ideal floor lamp height. Bedside lamps should be 24 t0 27 inches tall. 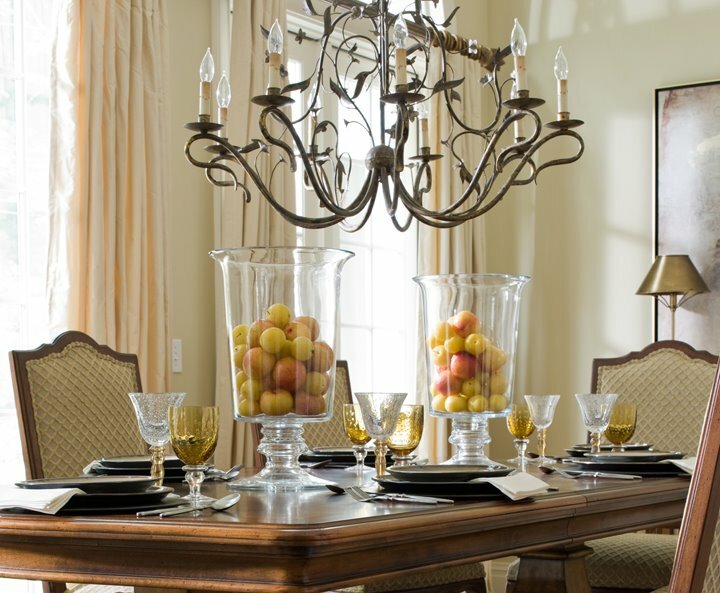 Dining room chandeliers should be hung thirty six inches above the center of the table. -Art should be hung five to seven inches above the furniture. Art should never be the same width as the sofa. In art groupings there should be two to three inches between frames.